Someone called me the other night and told me that my blog had been blocked by the school district. 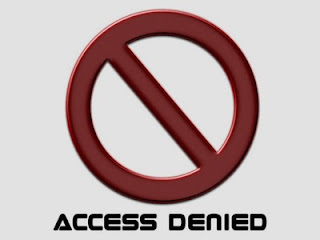 The person had been accessing the blog all these many years while at work and discovered that day that access was denied. I saw it for myself the next time I was at Youngest's school. Type in my blog address while using a district server, and you see a big ACCESS DENIED. Fair enough, really. I do use adult language. Of course, I've used adult language for most of the nearly five years I've been blogging. True, I have been far more freer in my use of "f#$k" over the past year or so, particularly as I have been ripping up the school district and the superintendent on their major screw-ups, and I have been accusing them of lying and being disingenuous. All of a sudden the filters at the district have kicked into gear? I mean, I've never been able to access, say, Dooce's site while at the school, so it's not like a new filter has gone into effect. What do you think? Is it the language I use? Or is it the stories I tell with the language? Definitely the stories. Funny how things work when it becomes conveninet for the other parties. Too bad for the people at the school who enjoy reading your site. I don't think more than a few people read it from the school district. But obviously someone does. I'm going to say the latter, although it shows a surprising amount of coordination from the district. The IRL friends I have who read this messaged me about it, calling it "creepy." Eh. "Creepy" really feels par for the course with the folks there. The feebs... so obvious. Keep up the stories, they can't stop you, only slow you down. definitely the stories accompanied by the language...definitely someone feels threatened...hmmm! I almost had to laugh at this. What a pitiful attempt on the part of the School Board to keep the voice of reason and awareness from being heard. Do they really find you all that dangerous? Apparently they do, sounds like they don't feel too secure in their position! You should be honored to be blacklisted, it cries out for a letter to the editor of the local news!